This is one the best of my first efforts with the new camera. It was a cold and windy day with the sun in and out of fast moving clouds. It took a lot of patience and many failed attempts before I captured this. I know I need a lot more practice. Any advice? I've been lurking here for a few weeks and have already learned quite a bit from you guys. Thanks. Very nice... one of the things that makes this compostion interesting is that the rose is off-center. Did you do this on purpose? Just keep doing what you are doing.. Practice. Your photo looks better than a lot of my first attempts.. Yes, the bloom off center was deliberate. I,ve been reading some essays on composition. This forum and the Luminous Landscape website have been my favorite reading for the last month. Thanks for your input. I've been both educated and entertained by all your posts. Very clear / sharp picture. I am still deciding between the FZ20 and a Nikon 8800. This is very convincing as to the benefits of the FZ20. The -2/3 EV was an attempt to avoid overexposing. The sun was very bright one minute and dark the next, due to a strong wind and scattered clouds. I had to wait for an opportunity to take the shot when the sun was out and the wind was still for a second or two. 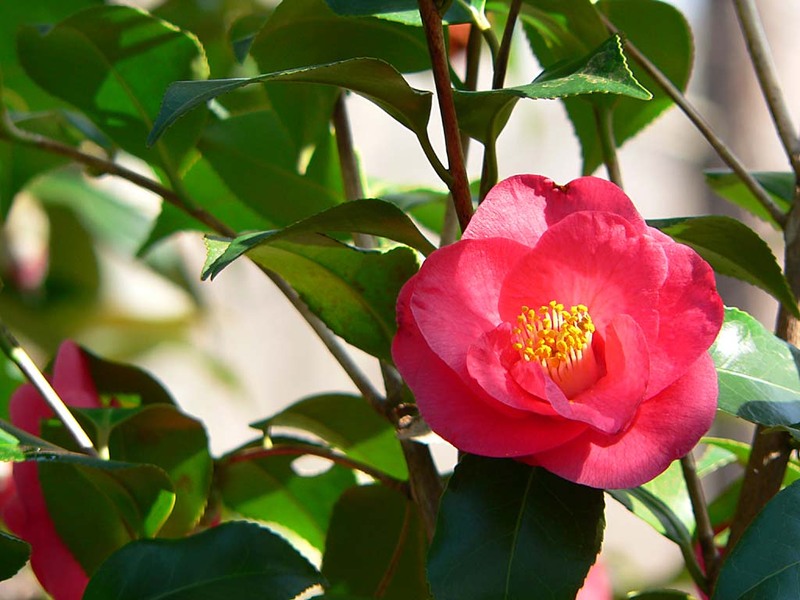 When the sun was obscured it was pretty dark, especially since the camellia was in a sheltered location surrounded by thick evergreens, mainly rhododendrons, mountain laurel and Japanese andromeda. When the sun was out it was very bright. I took five or six shots before moving on. That was the only keeper. The others were either poorly exposed, blurred from the wind because of poorly timed shots, or both. But, hey, it was worth it. I think it turned out okay and I learned something. I was considering the Nikon 8800 as well, but something about the FZ20 with that big Leica lens spoke to me. I read a lot of reviews, but just kept coming back to the Panasonic. The name doesn't have quite the same cachet or panache, or whatever you call it, that Nikon does, but I'm very happy with it. Even if there were no price difference, I still would have opted for the FZ20. It's incredibly versatile, an outstanding value and a joy to use. I'm not that experienced, but have managed to take some good shots, and am learning all the time. It's a camera I can grow into. I'm very happy with it. Now that I've finished rhapsodizing, I'll answer your question. I didn't do any cropping. Just resized, did a slight bit of unsharp mask in Photoshop: 70%, 1.2 radius, threshold 1. If you download the picture you can read the EXIF data in most photo editing software, but just in case, here are some details: F 4.0, 1/80 second, focal length 58.3 mm, ISO 80, spot metered. Hope you choose an FZ20, but the important thing is to just shoot a lot of pictures. I don't think you can go wrong whether you buy a Nikon or a Fuji or an FZ-whatever. My wife has a Fuji Finepix 3100 and loves it. It's a simpler point and shoot with fewer options, but she loves it and takes some pretty good shots too. Having said that, if you get the FZ-20 instead of the N8800, you'll save enough money to buy a high speed 1 Gig SD card and a few other goodies too.